Signed with monogram (lower right). Oil on canvas, in the artist’s original frame. 15 ¼ x 27 5/8 in. (39 x 70 cm.) Painted in 1866. Leaving Jerusalem in 1858, Lear travelled to Lebanon, arriving in Beirut on 11 May. ‘This place’ he wrote to his sister Ann on 14 May 1858, ‘is quite different from anything in southern Palestine – & reminds me more of Naples by its numerous villas & gardens, & the civil & gay people. I was only looking about me yesterday, but today I shall make a drawing of Mt. Lebanon, & the Bay & town – which are really lovely as a whole…’ A few weeks later, in a letter to his friend and patron Lady Waldegrave, he noted that that ‘all the Lebanon Country is safe & pleasant…the higher portions of Lebanon, i.e. the outer side – recall Etna’ (27 May 1858). The horizontal layout of the painting is emphasised in Lear’s carefully considered composition, filled with an astounding depth of colour and light, with the rocky promontory looming out of the foreground leading the eye across the azure water to the city at the base of the luminous mountain. We are grateful to Briony Llewellyn for her help in preparing this catalogue entry. 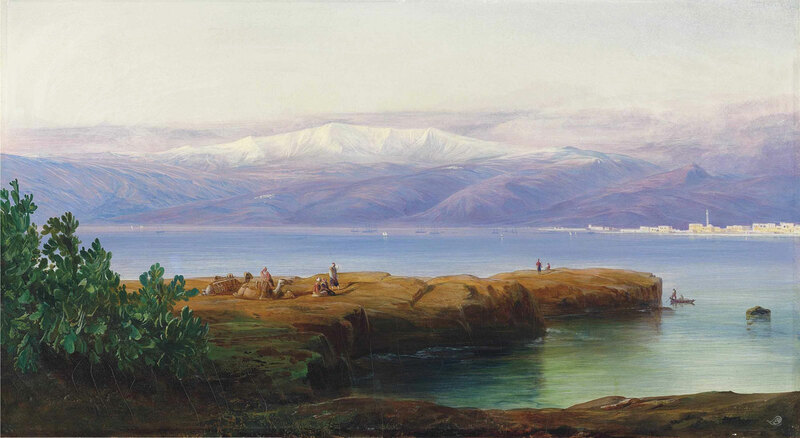 This entry was posted in Edward Lear and tagged Edward Lear, landscape, oil paintings, Palestine, travel. Bookmark the permalink.